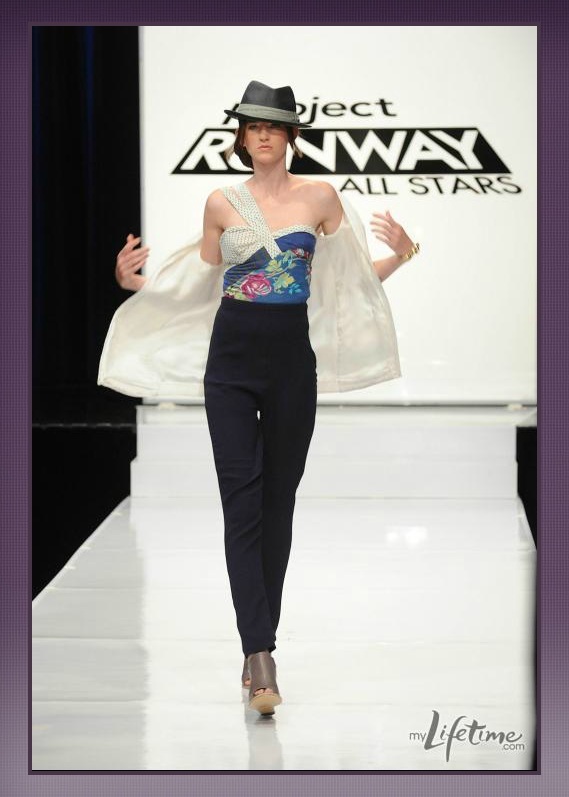 What an episode this week for Project Runway All Stars! This week the designers are brought to Central Park, and told they must acquire clothes literally off of the backs of people walking around Central Park, to use as half of their outfit for this week’s challenge. I don’t know about you, but I would NEVER give some random people, cameras or not, the clothes I’m wearing for a “challenge”. Heck no! Jerell had a cool concept, a lot of prints, but probably needs to be refined a little before most ladies would wear it. I think credit is owed to him though, for thinking outside the box. I like Kara’s shirt, though that style pant never really appeals to me. I really wish she didn’t get help in the construction, but what can you do. Rami was this week’s top favorite for me, although I could do without the hat! All of the elements looked as though they were constructed beautifully; however I just adore those shorts! Those details were just perfect and I would personally buy them in a second! I am sincerely sorry to see Anthony go this week. He always brought something different than the other designers week after week. But obviously this is a reality TV show, and things are skewed to fit the end result. Having said all of this, Anthony will undoubtedly go far in the world of fashion. He is a strong and talented individual, and will stand the test of time in the fashion industry, opposed to someone say, Michael, who appears to cry on a daily basis. Rock on Anthony! Personally, I think too many other looks for this week were either boring, poorly constructed, or just unflattering, that should have been sent out the door, but I’m not in charge so what can I do. I think we are probably in for some high drama next week though. And then there was 8.